Day #58 of our journey was going to take us to the famed Yellowstone National Park. 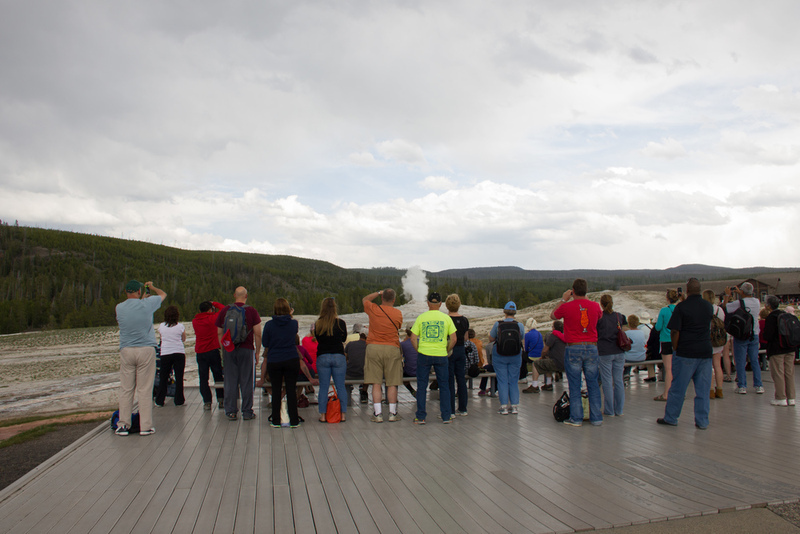 What I knew of the park was mainly wildlife (read: bison) and geysers (read: old faithful). I knew that it was big and I knew that it was mountainous and that's about it. Particularly in the few days before driving down there Whitney kept saying, "if we don't see any bison, I'm gonna be really disappointed." No pressure Yellowstone. I'd already been feeling pretty shabby, so much so that Whitney had been doing a lot of the drive from Brownies Hostel, which had taken us through Browning, MT (at that time seemingly consumed by a fierce public office election) and across vast stretches of prairie. As I was drifting in between my two co-pilot states of napping and taking pictures we traversed the big sky country for endless hours. The ridges of grass green hill chains bobbing up and down in front of the windshield, with puffy white clouds overhead. All the while we were being accompanied by the mountains of the Lewis Range to our right. Signs of open ranges continuously warned us of roaming cattle and the biggest hinderance to our progress was a road construction site which we were lead through by a truck with a Follow Me sign on it. In Helena, we stopped to load up on groceries for the next few camping nights. Since neither of our sinuses were feeling particularly groovy, we decided on chicken soup for the evening (NOT from a can). We also grabbed some granola and other supplies that had worked out well for us in the past and then continued on our path towards the park. Coming down south along route 191/287 we entered the park from the West, with the end goal being the campground at Madison Junction. You'll think this is crazy, but we actually had enough time to set up our tent, and then make the roundtrip to the visitor center near Old Faithful. All during day light! 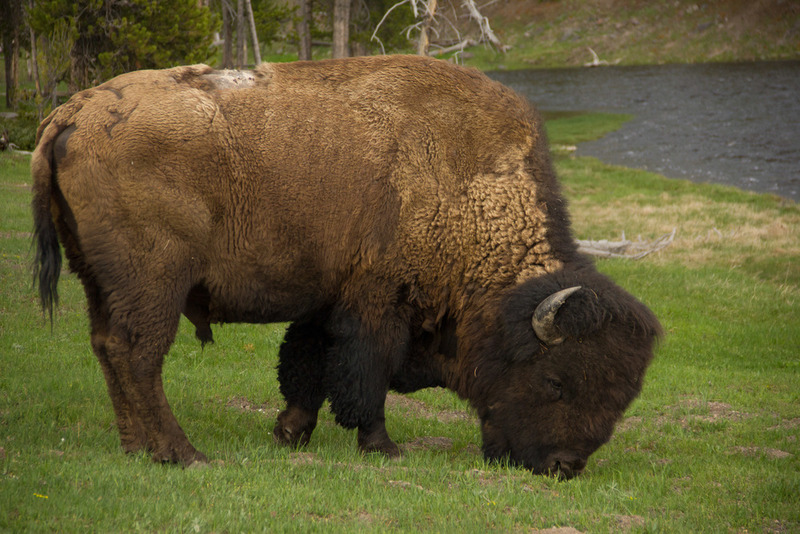 Of course, we saw bison galore already on that very first drive through the park. I mean it's pretty tough not to. They are big, they are slow and they make a funny huffing noise when they're grazing. Reminds me a little bit of the times growing up when we would stay on farms in Switzerland or the Landwirtschaftspraktikum (yep, that word is street legal in Germany) when being around 2000 pound animals was a daily occurrence. Tempting as it was, we didn't spend too much time away from the campground, because we still had to make dinner and wanted to get to sleep at a reasonable hour. We woke up the next morning to Whitney feeling the effects of a worsening sinus congestion. So after just making a bit of tea, we intended to set out to get Whitney to a shower, so she could hopefully drain her sinuses to relieve the pressure. Due to a series of unfortunate decisions and events, we didn't make it to a place with showers until Evanston, WY! 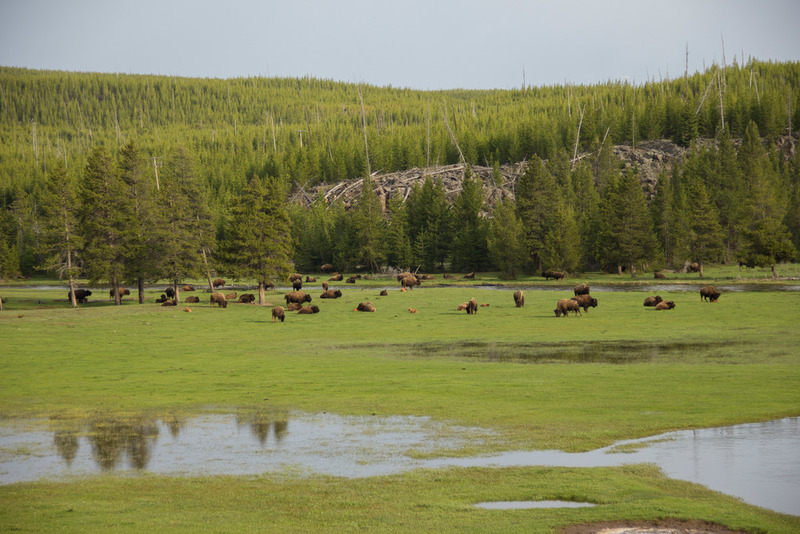 We started with the best of intentions on a trip clockwise around the Yellowstone park. One of the thoughts Whitney and I would discuss later at length regarding Yellowstone is, that it was perfect for a sick day or two. The reason is simple: Yellowstone is laid out to be explored by car. Sure there are hikes and most of the attractions of the park can't be seen from the road directly. However, almost all of the spectacular sights and amazing nature can be enjoyed from your car or otherwise after a very short stroll from the parking lot. So if you're not feeling well, which neither of us were, this park is about as good as it gets. The first time I pulled over the car, was at Gibbon Falls. They are tame in comparison, but it set the tone in terms of what we could expect for the rest of the day. Not necessarily regarding the kinds of attractions, but more the company we'd be "enjoying". It's certainly a busy park and more than once I asked myself, how the park service was ensuring the proper preservation, when the crowds were already so thick in late May? We drove up to Canyon Village, got gas which was surprisingly not over priced (I know, right?) and then I wanted to go up to Dunraven Pass and Mt. Washburn. Naturally, we weren't going to go on a hike with Whitney feeling worse for the wear as the day continued. Still, I wanted to see the other side of the park, but realizing that it wasn't all that I had hoped it to be, I soon turned back to continue our loop around the park. I dragged our poor Whitney out of the car again and again: "Do you want to see the Yellowstone Falls? ", "Should we go to Inspiration Point? ", "I'll take the South Rim Drive out to Artists Point, okay?" or "How about the Sulphur Cauldron or the Mud Volcano?" Ladies and gentlemen: no words! Over and over again, Whitney said "I'm really not feeling so hot, but I want to get out of the car anyway." I was really glad that she did, because she'd let me know about the different things she recalled from coming to the park the first time when she was 9 years old. That time the family had travelled out with her grandparents. That's important to note, since Pop-pop (amongst many others) has been a driver of our artistic expression, and I never even met the guy. Also, at Painters Point she sneezed like a four year old. You know, snot hanging by thick threads out of her nose all the while she's looking back at me at least as shocked as I am looking at her. It was funny, you had to have been there. Pop-pop himself was a painter (oils and water colors) and going through his catalogue a couple of years back in order to make a book of his work, turned into a learning experience of sorts for us. Looking back, it was around that time that we, and certainly I, felt compelled to get back to creating more art from scratch. With my hands. With paint. Whitney recalled going out to Artist Point with Pop-pop and showed me the colorful earth and rocks surrounding the Yellowstone River Canyon, just below the water falls. A little later we stopped at the Sulphur Cauldron and Mud Volcano (the names!). It was the first of many stops along the parks famed thermal elements. If you have any inclination of going, just go. I can tell you all about it here, but it's just incredible to see the sheer number of different springs and pools and geysers, and mud pots and so on. The park service was also quick to illustrate that the thermal features were constantly in flux and could change at any point. Hot springs slowly moved over hundreds of feet. Geysers go dormant and reemerge. As a matter of fact the area surrounding the Mud Volcano had completely changed in the 1980's due to a number of earthquakes. A sharp increase in the ground temperature following the quakes has been killing the trees along the hillside ever since. 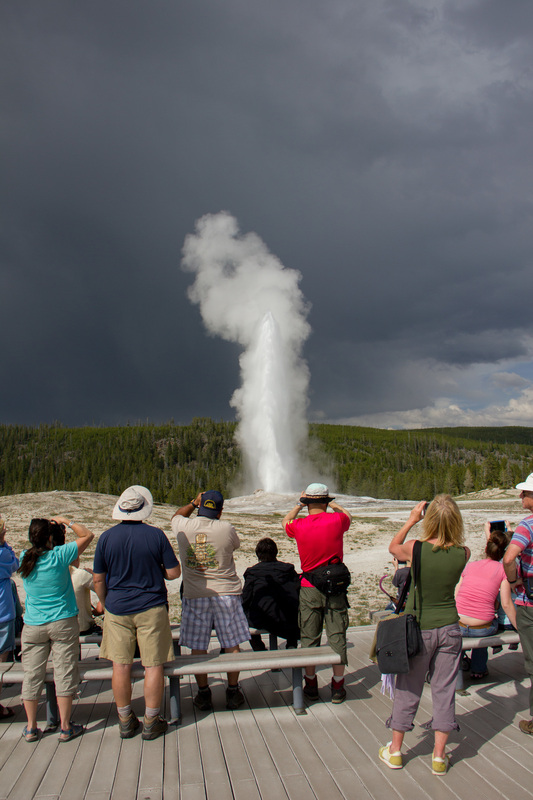 Finally, our loop took us by the grand stage of the Old Faithful. The area around the geyser is completely built up with shops, the visitor center, restaurants, you name it. It is a bustling complex ready to handle many, many tour busses filled with tourists from far away countries and loads of minivan's filled with vacationing families form not so far away. The geyser itself is surrounded by a large circular boardwalk, which has conveniently placed benches along the edge to view the geyser. Considering, that people used to throw logs and rocks and handkerchiefs into the geyser back in the day, the boardwalk it probably a sound idea. We treated ourselves to milk shakes at one of the restaurants (which were delicious!) and got back in the car to get back to the campground. You see, before we left in the morning we were sure it wasn't going to rain, but because you're an attentive reader you remember the "dark sky", right? We were worried that the rain had gotten into the tent and we wanted to either deal with it, or prevent further soaking. Luckily, though the tent had seen a sprinkle, nothing seemed to have gotten wet. On the way back from Old Faithful I had also spotted a bison herd near the road and I really wanted to get some good pictures of those guys. Whitney relented and back out we went to get Sam some bison. Not far down the road was a little off shoot of the main loop where we found at least a couple hundred bison grazing. From a distance, we were able to see big bulls, nursing calfs, play fighting youngsters and more. It's a marvelous thing to be able to get in such close proximity of such large mammals. That these guys were mercilessly slaughtered isn't easy to stomach, but considering their relatively peaceful demeanor it isn't hard to imagine either. Anyway, I got my pictures! Back at the campground we made another simple dinner, and then headed up to the "amphitheater" to hear a ranger talk on the parks history and flora and fauna. Whitney and I were quickly getting to like these talks and if you're the National Park visiting kind, it's worth checking them out. I for one really liked getting context for my visit and being able to ask some questions afterwards (i.e. "What's it really called, a bison or a buffalo?"). Tired but satisfied we went to sleep, soon after. The next morning I was starting to feel better, but no such luck for Whitney. Despite our honest efforts to rest well, drink plenty of tea and to feed ourselves the way Sue would have, Whitney's throat was still hurting and her sinuses stuffed. Being on the road however meant that we could only do so much and Whitney was being a trooper. While in the park, we wanted to visit as many of the thermal springs and geysers as we could, before we had to leave later in the day. So we broke camp, loaded the car back up, made sure that we had all the lozenges and a thermos of hot tea within arms reach and set out. The park has just tons and tons of thermal features. The most famous of them, after Old Faithful, is the Grand Prismatic Spring, but there are so many others! As we headed south along the loop towards Grant Village and the South Entrance of the park we first steered the Omimobile into the Firehole Lake Drive. I guess, because none of the drives features are as bombastic as others in the park it wasn't as crowded, which suited us just fine. Along the route we stopped at the Firehole Spring, Surprise Pool, Great Fountain, White Dome and Pink Cone Geysers before finally arriving at Firehole Lake and Steady Geyser. That's a whopping seven geothermal whatchamacallems! And they're all very different. Some are still steaming colorful pools, others gurgling mud pots, others again spout water high into the air. While I was busy clicking away, Whitney was lamenting the fact that she wasn't able to jump into one of the hot springs. So she did the next best thing: at each spring that was particularly hot and steaming she found the perfect spot to stand in the steam as the wind carried it away from the pool. Even sitting here on the soft bed at an airbnb thousands of miles away, I can still smell the sulphur with each breath as I think back. As the expedition photographer I wanted to go to the Prism Pool of course. Interestingly, you really can't get that famous overhead shot you always see very easily. You'd have to go on a hike, to gain enough elevation . . . and then hope it's warm enough out that there isn't too much steam coming off the surface of the pool. Still, we got to walk around it and see the other pools as well. It's a neat place and the colors are amazing. It's terribly crowded though with tour bus after tour bus arriving, so we left before too long. On our way out, we once again stopped for a sandwich at the Old Faithful Visitor Center and (accidentally) saw the geyser erupt for a second time. Not bad! With a little bit of food in our tummies we finally bid the park adieu and began our long treck to Moab. Hang on! We saw some more elk on the way out. 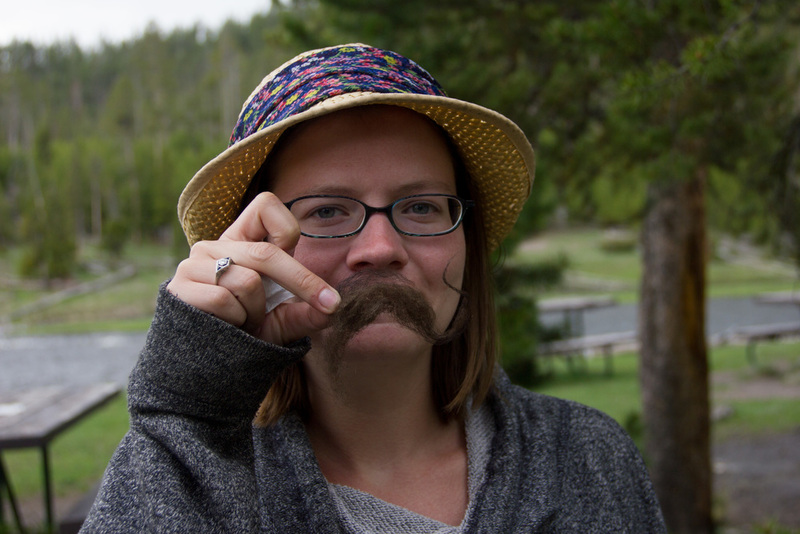 In hindsight, I wished we had more time at Yellowstone (as was the case in so many other places). I wouldn't have minded being able to do a hike or two. That being said, with some time and patience and a camera you can explore most of what's there to see. There are also many more pictures from this part of the trip, that didn't make it into the post, but I'll do my best to get them uploaded to Flickr soon.